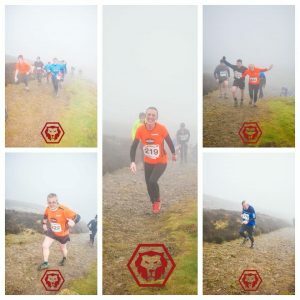 The Moel Famau 8K is an event put on by Lion Races and I took part in it on Sunday 28th January 2018 along with Alan Rothwell, Fiona Duckers and Andrea Robinson, making sure there was a good orange presence. The race starts at 10am, quite civilised, in the beautiful setting of Moel Famau. Race numbers are collected on the morning, really easily done, and was lovely to collect our numbers from our very own Liz Leay, volunteer extraordinaire! Chip timing is by way of velcro tag around your ankle; so, feeling slightly like criminals we toddled off to the start (via the toilet, obviously!!!) Toilets at this race are “actual” toilets, which is a very important issue to some of us!! It was a cold but dry, and surprisingly nice, morning and off we went up the mountain! Trail shoes are definitely a must, it was pretty muddy underfoot in parts. What a climb; unless you were part mountain goat you couldn’t run up the really steep parts, but with encouragement from a very kind stranger and possibly a few swear words I made it to the top. I’d love to say the view was spectacular, however, it was so foggy and windy I couldn’t see a thing and it was all I could do to not get blown away. Downhill was a little scary: steep mountain + mud + wind = heart-in-your-mouth but I made it down in one piece and the views on the way down were amazing!!! I crossed the line with Fiona, hand in hand! Nice medal, bottle of water and most importantly the choice of some chocolate goodies at the finish. In true runner fashion I uttered the words “Never again” however we hadn’t even got home before I was uttering the words “Think I’ll do that again, actually”(!) A nice little well organised event, can imagine it not being quite so pleasant in bad weather… but definitely one for next year’s calendar.